Oh, Sweet Joy will be at Firefly Handmade Market on September 17th and 18th. Be sure to come see us and buy some goodies & gifts! I'm trying not to freak out that I have ZERO inventory. Trying. 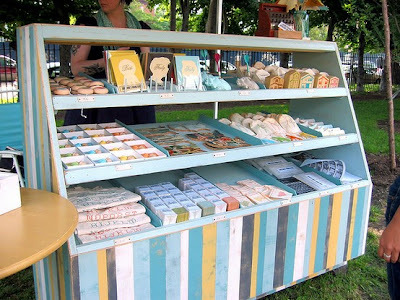 The theme for the market is "gypsy farm market" and I am pumped to be challenged in how I set up my booth. 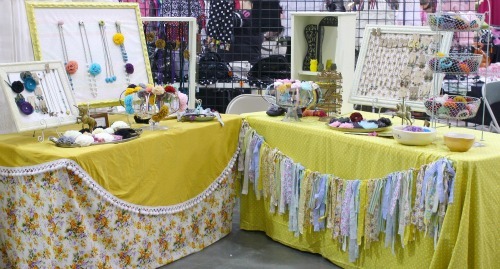 In most handmade markets I participate in, I just opt for the table. This time around, I splurged on a booth space ((rather than a table space)) and am excited about having a more "boutique" feel when people come shop my handmade loot. This is what it typically looks like. Photo 1 is at Creative Estates this past Spring. Photo 2 is from Firefly Handmade's Holiday Market this past December. I know for sure that I want some sort of fence somewhere in my booth. I'm wanting an eclectic and "layered" look, but I want it to be simple enough to where my products stand out more than my display. I'd love different reclaimed pieces to use as part of my display. Here are some photos that I've been inspired by for my booth! 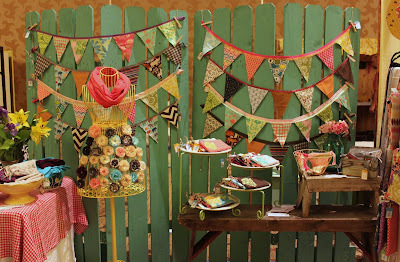 Erin is the master of craft shows and I always love to see what she comes up with for her booth displays. 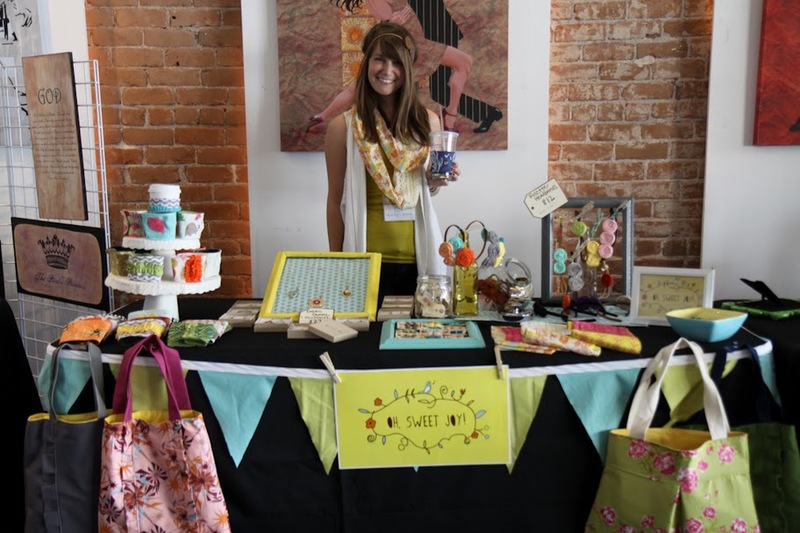 Our products are similar in that there is SO much color, so I'd love to let my products speak for themselves and have the display complement them, as Erin does so well. 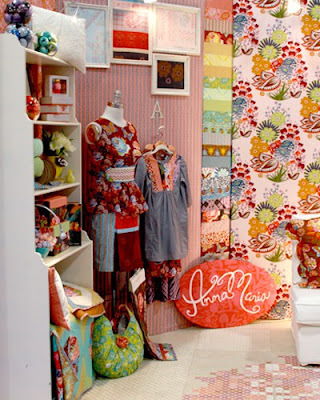 I always enjoy seeing Anna Maria Horner's fabric market booths. Shelves are such a simple & effective way to display your wares. I have a white shelf that would be perfect! 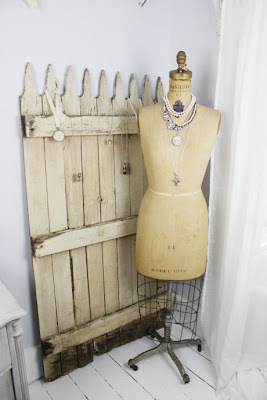 Nicole from OliveBlue was the original inspiration behind me wanting a fence as part of my set up. 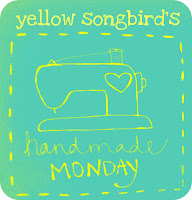 I love her robin's egg blue one and I'm thinking yellow would be SO fun for Oh, Sweet Joy! ((or white? thoughts?)) Photo courtesy of Nicole. I think I shall have Chase and his architect-engineer-self draw up a mock booth. I'll be sure to keep you posted with updates! Thanks for letting me think "out loud" in my planning stages. I'm just a bit excited! Oh my gosh love love love! So pretty! LOVE the old window. I have one in storage that I'm wanting to get out to hang over our couch in the living room... now i just have to find time to go get it ha ha! eeeep!! I love all these booths!! I can't wait to see how yours looks!! I am sure it will be beautiful! It IS so fun to dream! Can't wait to see what you come up with. I love the display case with the striped front the best. So clean and "professional" looking! Hard to transport I'd imagine though :-) Hope your day has been a good one so far! 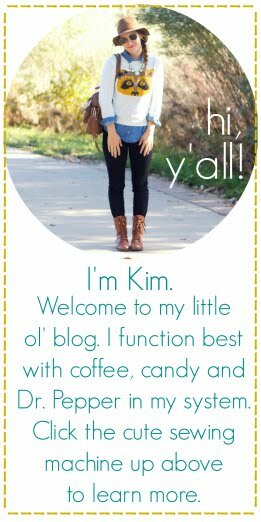 any or all of those ideas are awesome, kim! you'll do great at the market!! How exciting-I can't wait to see the final product! eep! i love the fence idea. how fun... do you know what would be crazy but maybe cool? if you painted it yellow or aqua then painted it over w/ white... then sanded it a bit so the yellow/aqua poked through. could be cool? Oh man. So much visual eye candy right in this little post. I am so into displays and finding inspirations. You just did all the work for me. So many talented and creative women out there! Including you sister! I LOVE the fence idea and I vote yellow. 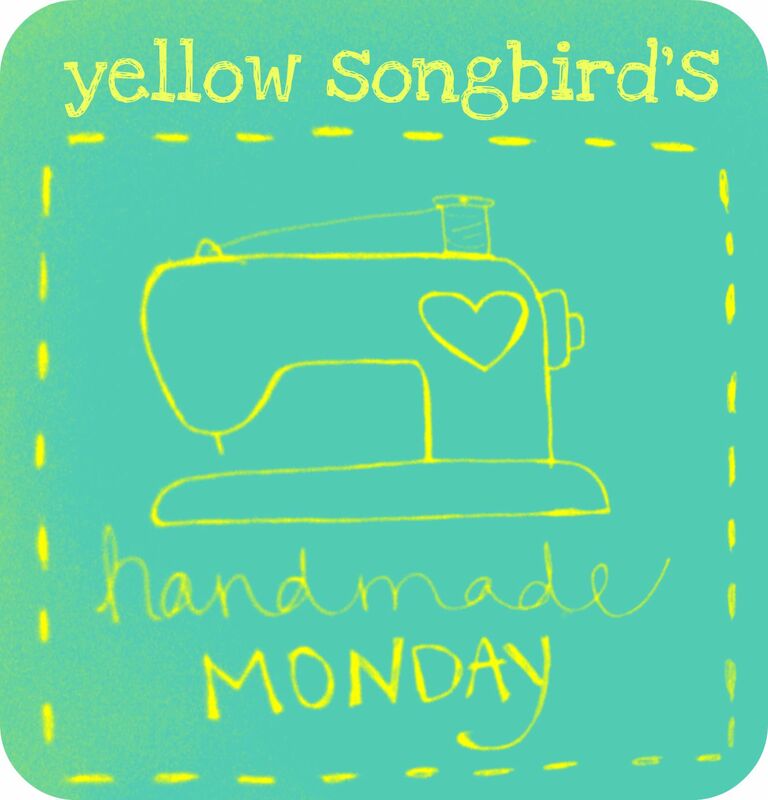 I feel like yellow is "you"....I don't know maybe it has something to do with your blog name?? haha! But really, yellow will stand out. Cant wait to see it all done! 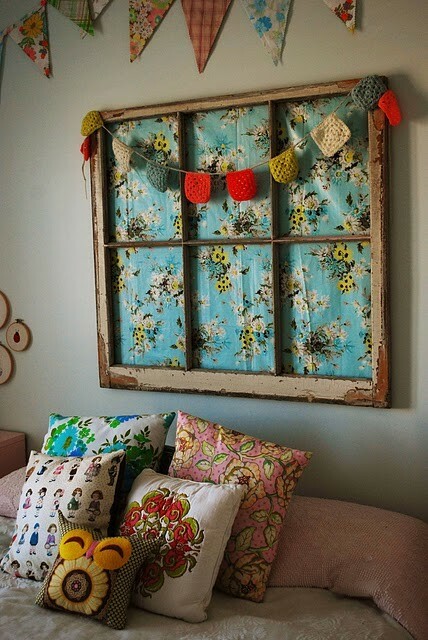 Oh so much pretty inspiration! Congrats on another FireFly market coming up! I love the yellow fence (maybe distressed looking?) and old windows! I know it will be gorgeous, Kimbo. I'm itching to do my first show, but all the shows here in Hawaii are flea market-esque with junk and not really the handmade vibe. loved your booth at CE - and these are def. some sweet inspiring pics. love erin's! I really like the fence idea... that looks like one that would look really good. Thank you for posting this booth inspiration! I really need them now. 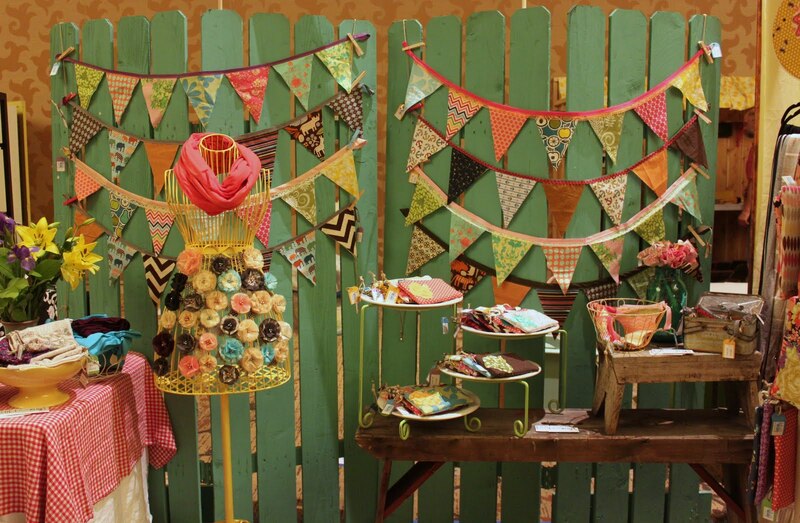 I love the idea of triangle bunting, cute! I like all these colorful things in this booth,all these are so beautiful..Seriously you really did a great job of building this lovely booth.. I'm so inspired from you..